The pupils have launched an appeal for help. Health and social care students at North East Scotland College are in the process of knitting blankets, hats and cardigans for stillborn babies which will be donated to Aberdeen’s maternity hospital. 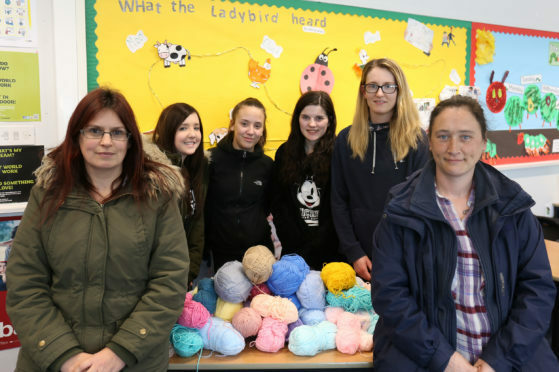 The group of six pupils launched the idea – Knitting for Sleeping Babies – as part of an enterprise unit on their course. And yesterday, group member Joanne Kiloh asked people across the north-east to donate what they could to help complete the project. She said: “We wanted to do something a bit different from the usual fundraising ideas and this is something that you don’t really hear too much about. In order to get their project off the ground, the group started a Facebook group and appealed for donations of knitting needles and wool online. To date, they have managed to fill six bags with donated wool in a rainbow of colours. Ms Kiloh added: “We’ve got the wool and needles, now we just need the knitters.